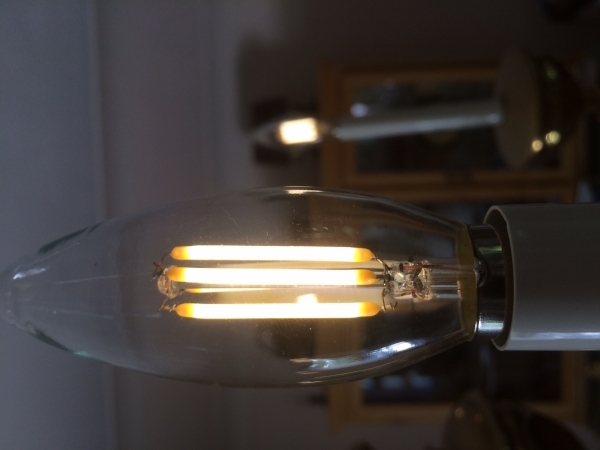 LED Filament Bulb - B10 LED Candelabra Bulb with 4 Watt Filament LED - Dimmable: On Showing Beam Pattern And Comparison Between Warm White (Right) and Ultra Warm White (Left) At Full Brightness. 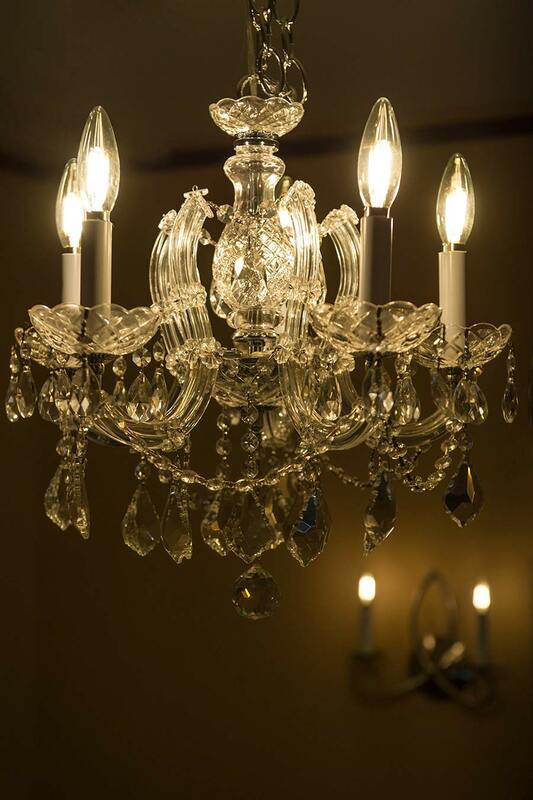 LED Filament Bulb - B10 LED Candelabra Bulb with 4 Watt Filament LED - Dimmable: Shown Installed In Vintage Chandelier. LED Filament Bulb - B10 LED Candelabra Bulb with 4 Watt Filament LED - Dimmable: Shown Installed In Chandelier And Hallway Hanging Light. 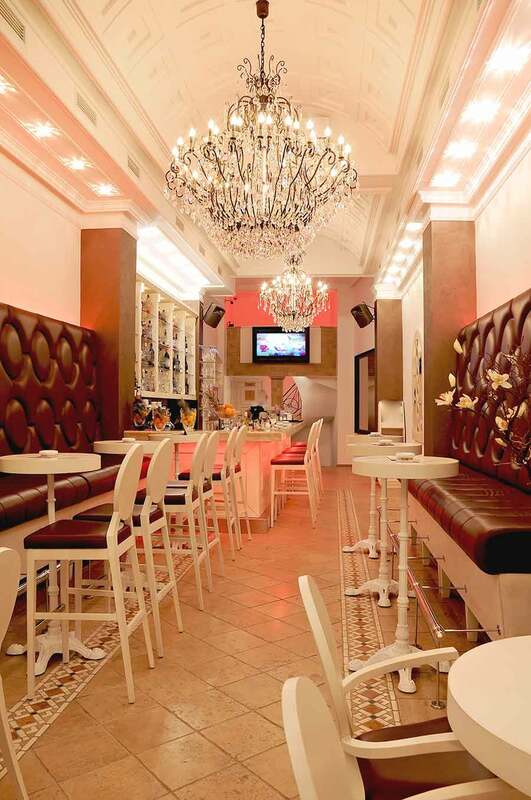 LED Filament Bulb - B10 LED Candelabra Bulb with 4 Watt Filament LED - Dimmable: Shown Installed In Restaurant Chandelier In Warm White. 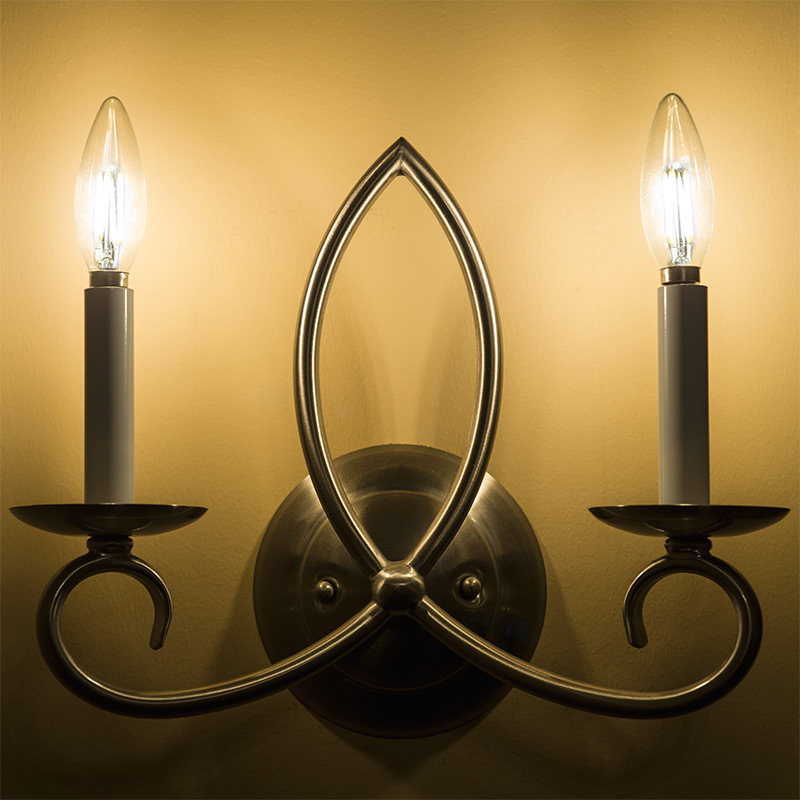 LED Filament Bulb - B10 LED Candelabra Bulb with 4 Watt Filament LED - Dimmable: Shown On And Installed In Wall Sconce. LED Filament Bulb - B10 LED Candelabra Bulb with 4 Watt Filament LED - Dimmable: Shown On (Full Brightness) And Installed In A Candelabra Style Chandelier. 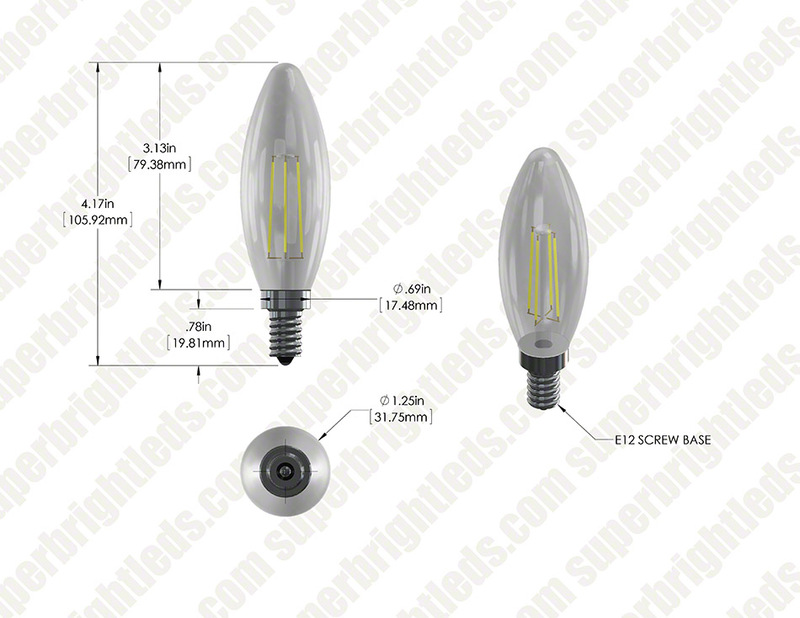 Perfect for bistro lights, large tents, decorative wedding lights, decorative light strands, commercial lighting strings, chandeliers, and ornamental fixtures, this dimmable B10 blunt-tip candelabra LED bulb is designed for use in applications that accept E12 bases. 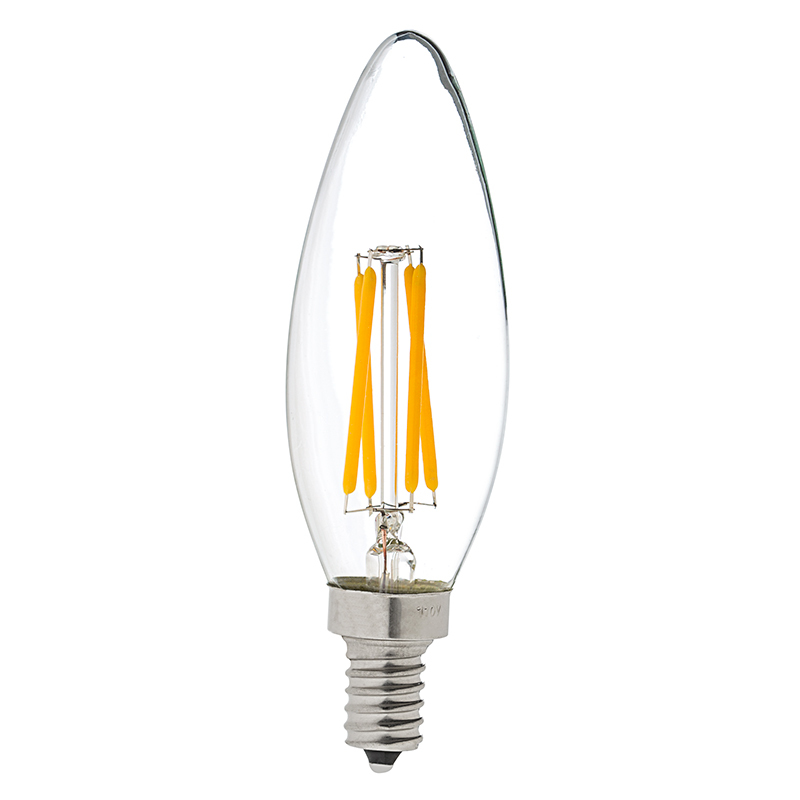 The dimmable bulb features 4 linear COB (chips-on-board) LEDs that imitate the look of thin filament wire in antique-style bulbs and can produce up to 350 lumens of warm white (2700K) or ultra warm white (2200K) illumination. The energy-efficient bulb uses only 4 watts of power; an incandescent bulb with comparable light output would consume 40 watts. 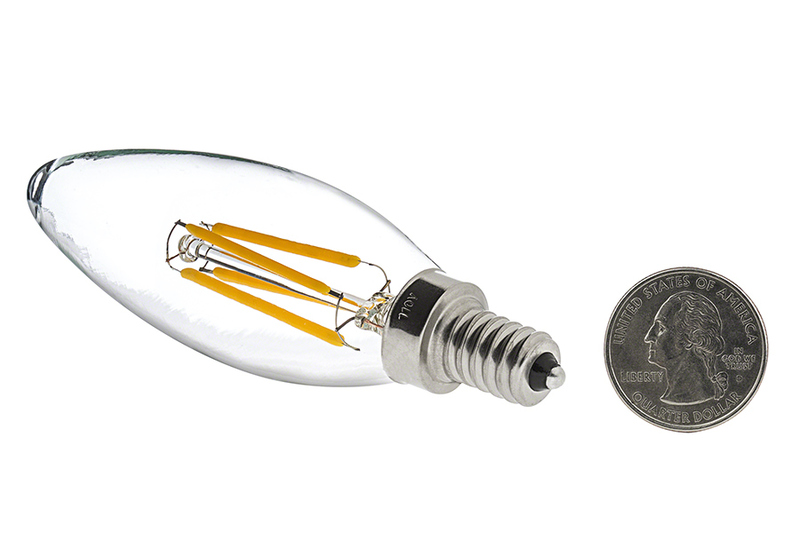 This bulb operates within a 90-145V AC range and is designed to last 30,000 hours—25 times longer than incandescent bulbs. Price per bulb or 6-pack. 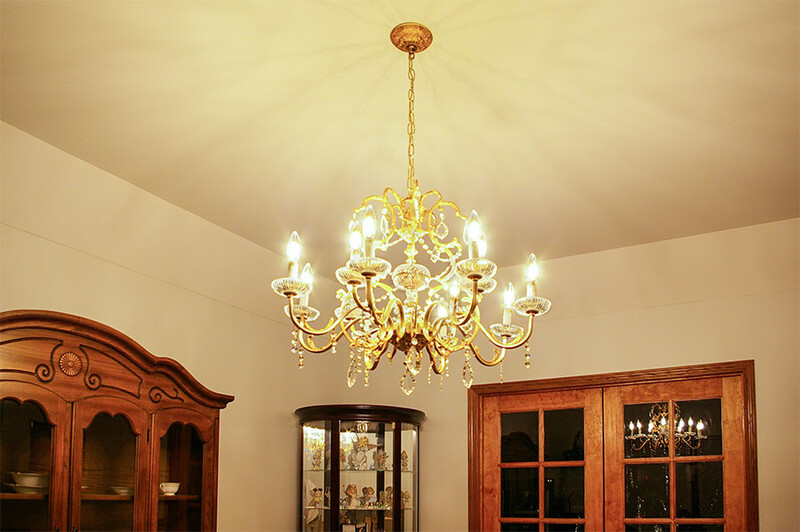 I replaced 8 bulbs in a dining room chandelier wanting to increase the brightness above what I could get from 25watt incandescent bulbs. 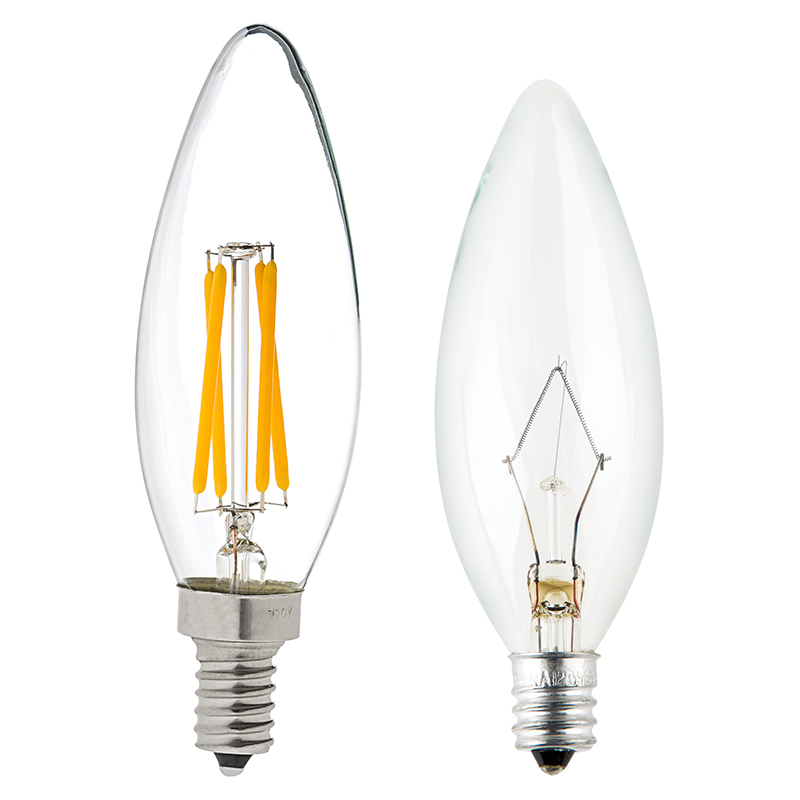 These match the color of the old bulbs with the warm white, some reviews had me thinking I should order the ultra warm, I and my wife think the standard warm white color is a match with the old incandescents. I wondered about the appearance of the fake filament, but I like it better than the incandescent's exposed filament in a clear bulb, expecially when it's dimmed slightly. When fully bright, the lamp is too bright to see the filament well. As mentionned, the lamps stay dimly lit when my old dimmer is turned down fully, but it includes a push to on/off. 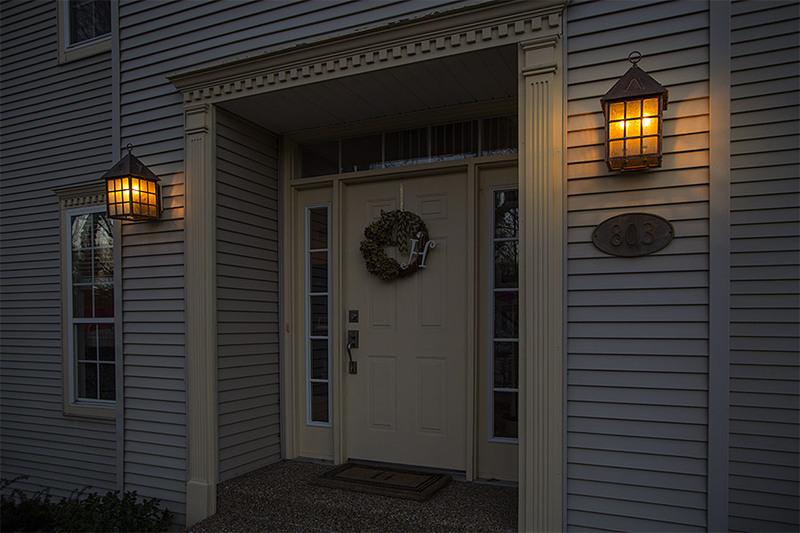 If yours does not, you may need to replace it when you change from incandescent to LED bulbs. The bulbs screw into the standard socket and look great. 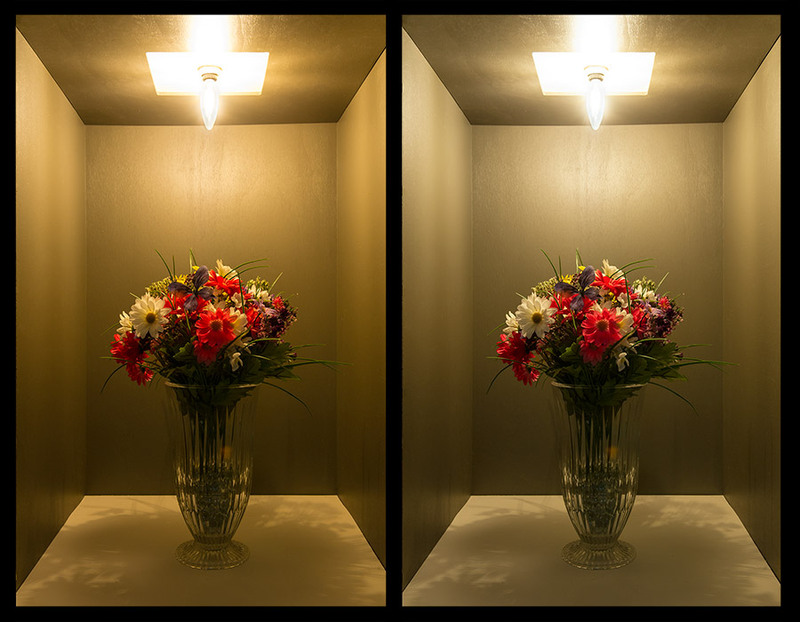 The photos show them full bright, half bright and a closeup of the 4 "filaments" in each bulb. I've been waiting for a good LED Chandelier style bulb for a while. I can't stand the ones that are half base and half light source. These look legit. And the color is perfect. 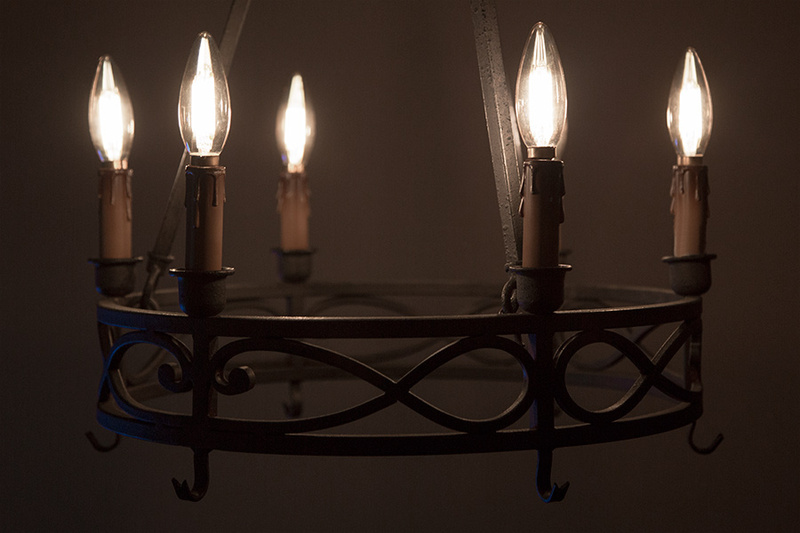 If you want a true color replacement for a filament chandelier bulb, get the Ultra Warm White. Only issue I ran into was the bulbs remained slightly on when I used them in light with a knob dimmer that rotated on/off (not push on/off). 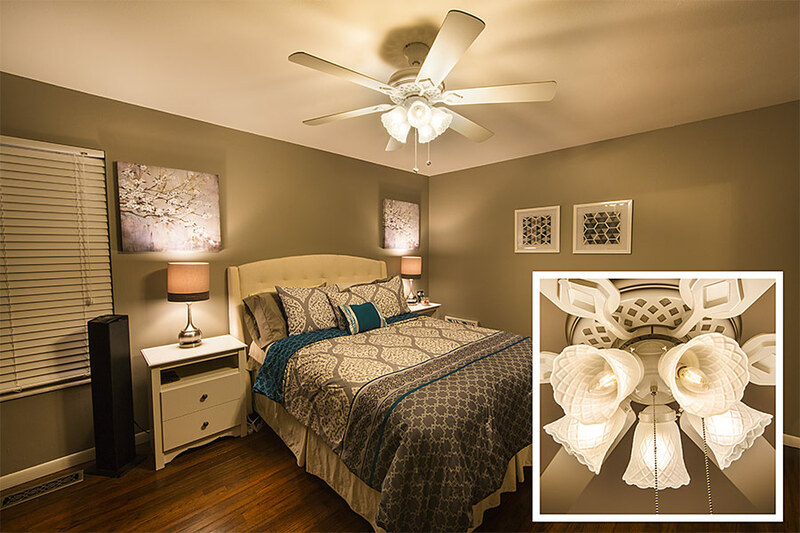 It's not a dimmer specifically for CFL/LED bulbs so that may have made a difference. 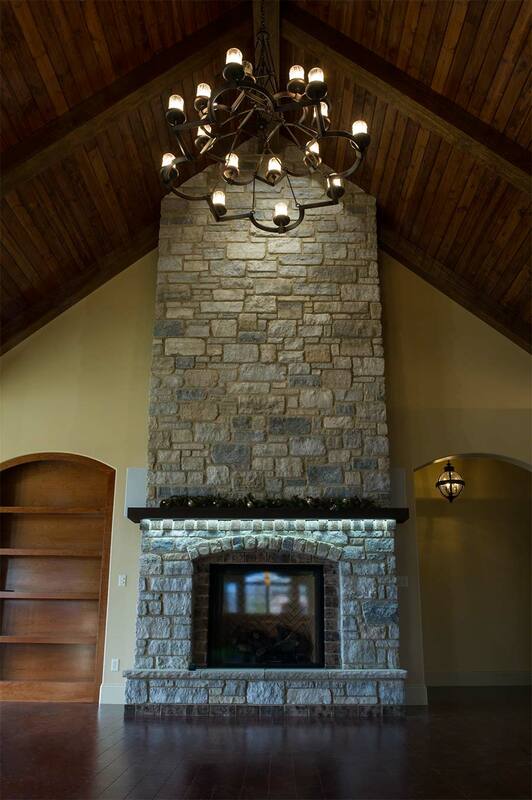 I moved them to another light that was on your typical on/off switch with a sliding dimmer and they worked fine. Happy with these LED lights in my chandelier! I had purchased 5 LED lights in the past to go into a fixture in my kitchen. The bases were high and the bulbs didn't provide much light in the downward direction that I needed. 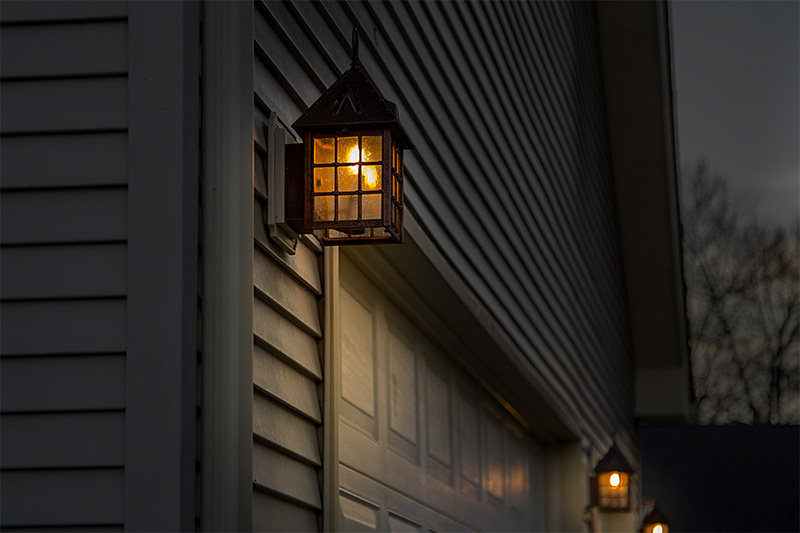 I returned those lights and thought I would have to keep using the incandescent bulbs I had always used. Recently I found this style and tried them. Very happy with the warm color and dispersion of light. I hope the lifespan is as promised but in the meantime I would suggest them as an excellent alternative to incandescent chandelier bulbs. Price wasn't bad either! I purchased five of these bulbs to try out in my 10 light chandelier. 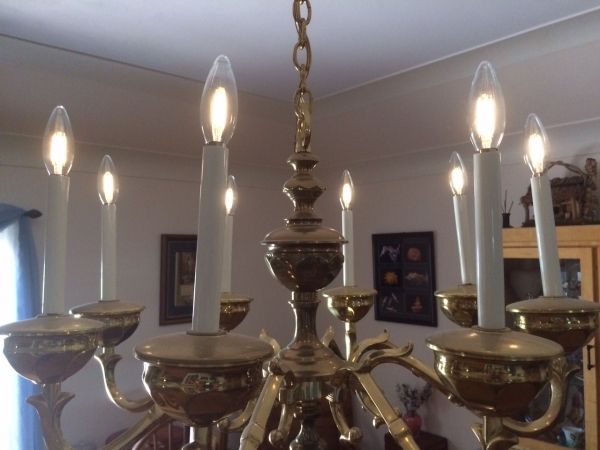 Once installed, the ultra warm light was indistinguishable from the remaining five incandescent bulbs. 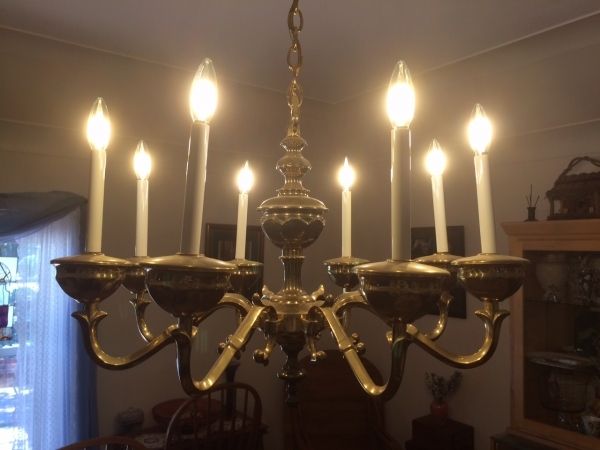 I've now purchased ten additional bulbs for this and another chandelier in my sun room. The bulbs dim well and work with my older style dimming switches. I've reduced the wattage in this fixture from 400 watts to 40 watts! Another bonus - these bulbs have a very high color rendition index rating and I noticed a vast improvement over some earlier generation LED chandelier bulbs I had purchased a while ago from a different vendor. Finally won over the wifey. I trial purchased 4 of the ultra warm white, since the 2700k units were not in stock. I was optimistic in seeing them once turned on, since I thought these would now please the wife. She did not like the half white plastic base our current Costco Feit candelabra bulbs, nor in the slightly cool 3000k color. She had to agree, these are a winner. These are slightly yellower than warm white, as advertised, so we are waiting for the 2700k bulbs to come in stock to compare and try in our chandelier.